It was really hard to make the decision to part with it, but I keep reminding myself that I can’t keep every skein or I’d never make any money. Seriously, I should be shopping around my tv-show idea, Fiber Hoarders. A therapist would show up to my house and be appalled at my massive amount of fiber piled up to the ceiling. I would stubbornly refuse to sell or donate anything. Perhaps my loved ones would stage an intervention telling me I was choosing the wool over my family and friends. Introducing 5 new Autumn-themed colors of NOM just in time for the 20% off sale!! Pictured below from left to right: Auburn, Killian, Pumpkin Pie, Pear Cider and Fatigue. 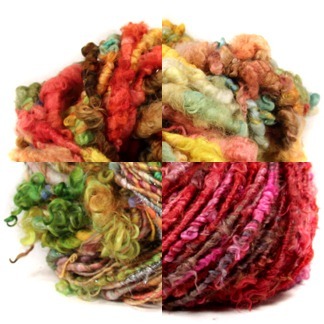 And for the first time in a long time, tons of new handspun yarn! I gave my wrists a nice long rest and now it’s back to business. My stash of raw fleece has been building all summer, and the new yarns are mostly big, shaggy core-spuns made from uncarded locks.